M.D. President & CEO, Comprehensive Primary Services Brooklyn, Mt. Vernon, New Rochelle, N.Y.
Ijeoma Nduka-Nwosu?s vision of a more comprehensive approach to health care led her to study and practice medicine in some of the most prestigious institutions. Her vision has been realized in the form of a thriving private medical practice in the New York area. Similarly, her belief that ?beauty, brain and business are not mutually exclusive? inspired her to open the Ejaye?s fashion stores in Nigeria, her homeland, and in the United States. Nduka-Nwosu, M.D., has been a determined high achiever since high school. She completed her secondary studies with distinction after the Nigeria civil war in 1971 and graduated with honors from the University of Nigeria Nsukka, earning degrees in medicine and surgery. She seized an opportunity to practice in London with Geoffery Chamberlain, renowned professor and consultant to Queen Charlotte?s Hospital for Women. From there she went to the Harvard University School of Public Health, where she received master?s degrees in maternal and child health and in science and epidemiology. Her next move was to New York, where she set up Comprehensive Primary Care Services with clinics in New Rochelle, Mt. Vernon and Brooklyn. Dr. Nduka-Nwosu says her parents and a college professor who opened doors ?when the education of women was not a social priority? inspired her most. She maintains her ties to Nigeria with Ejaye?s Charities, a non-profit organization she established to strengthen the quality of health care in rural communities, particularly in Africa. She has joined the global campaign against AIDS, bringing to light the socio-economic constraints in combating the epidemic. Because of her charitable work in Nigeria, her late father, His Royal Highness EZE F.B. Nduka, bestowed on her the traditional chieftaincy title of ?Nneoha,? which means ?everybody?s mother.? 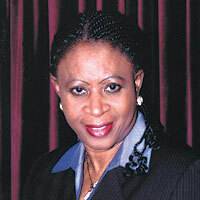 With all her accomplishments, Dr. Nduka-Nwosu is most proud of her husband Godwin and their five children. ?I?m devoted to them,? she says.